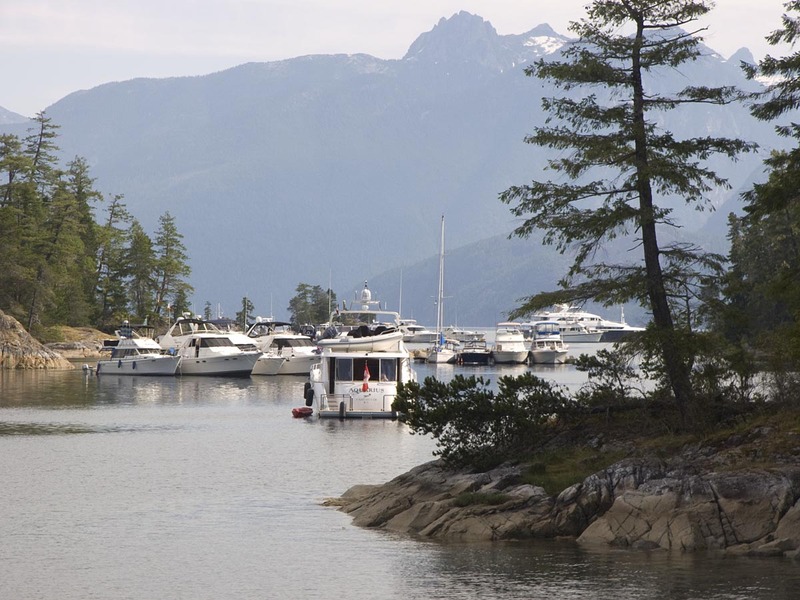 Here are several spectacular wooden boats that caught our eyes as we sailed between the Gulf Islands and Desolation Sound this summer. 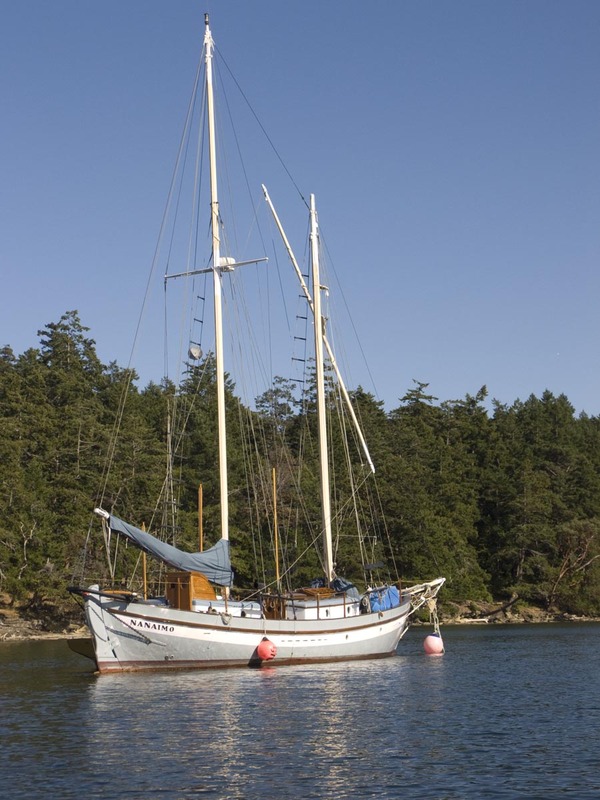 “Native Girl”, built and designed by Allen Farrell, seen here in Silva Bay. Note the yard-arm for the square sail. 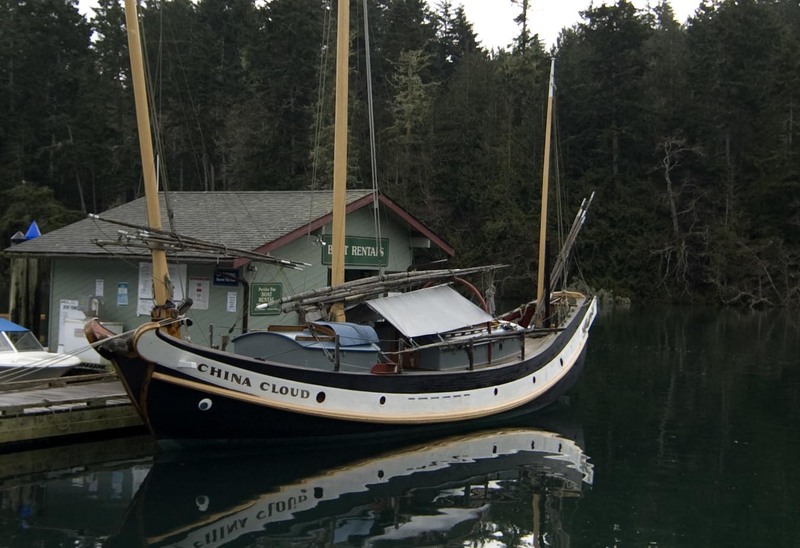 I couldn’t resist including this photograph of Allen’s last boat, which I came across in Pedder Bay in 2009. The story of Allen and Sharie Farrell is fascinating and documented in “Salt on the Wind” by Dan Rubin and “Sailing Back In Time” by Maria Coffey. Both “Native Girl” and “China Cloud” are breath-taking designs! 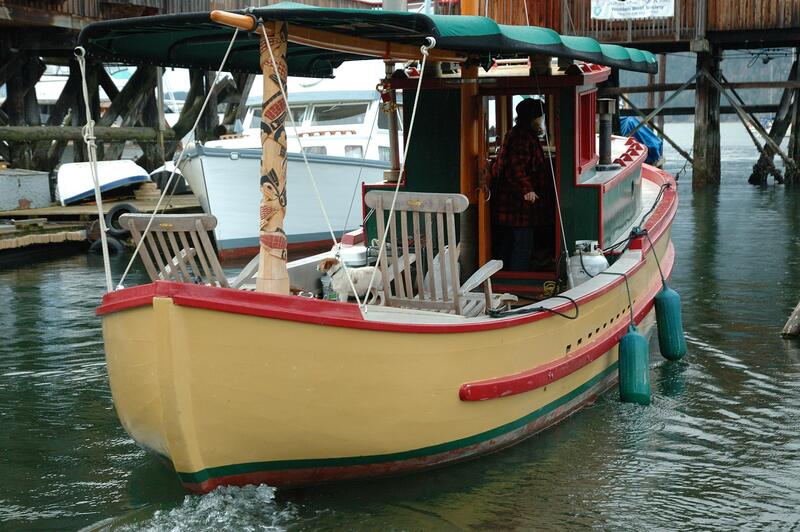 She was built by Maureen and Wayne Loiselle and was launched off a beach in 2000. Magnificent “Grail Dancer” at the Cowichan Bay Maritime Centre. 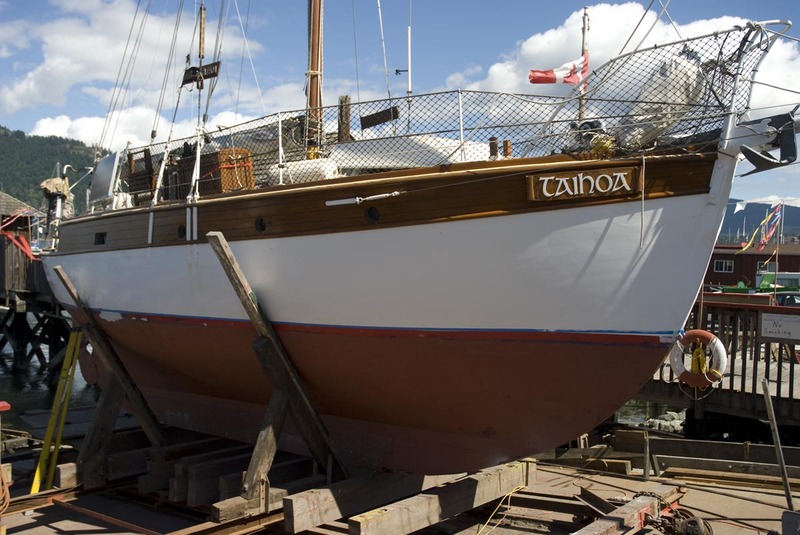 “Taihoa” is 48′ (L.O.A. ), design by George Band, launched in Vancouver in 1947. 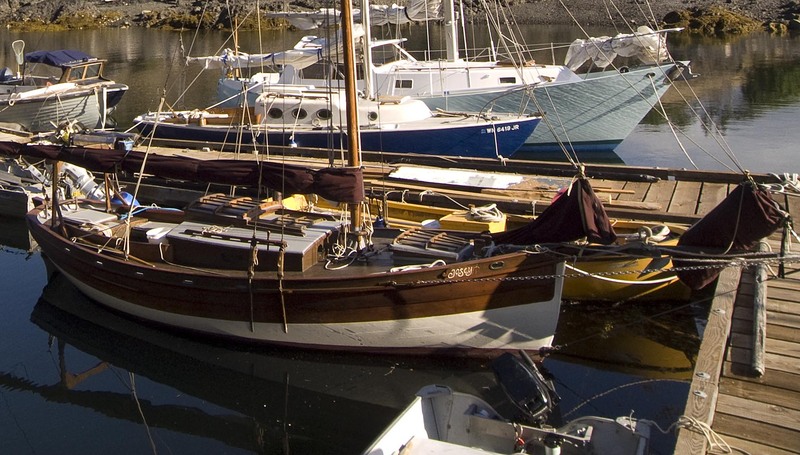 She is seen here during a haul-out on the newly refurbished ways at the Cowichan Bay Maritime Centre. “Taihoa” – a Colin Archer style, heavy displacement cutter. 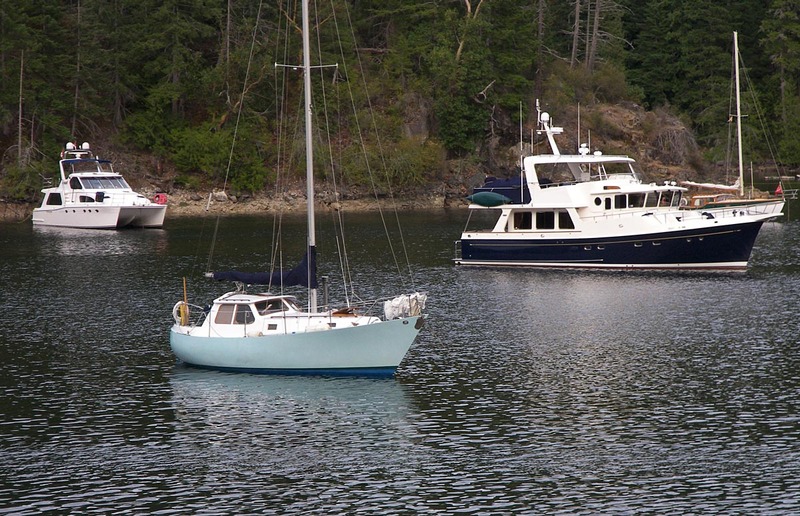 Finally, we came across this attractive Aitkin designed cutter in Squitty Cove on Lasqueti Island. 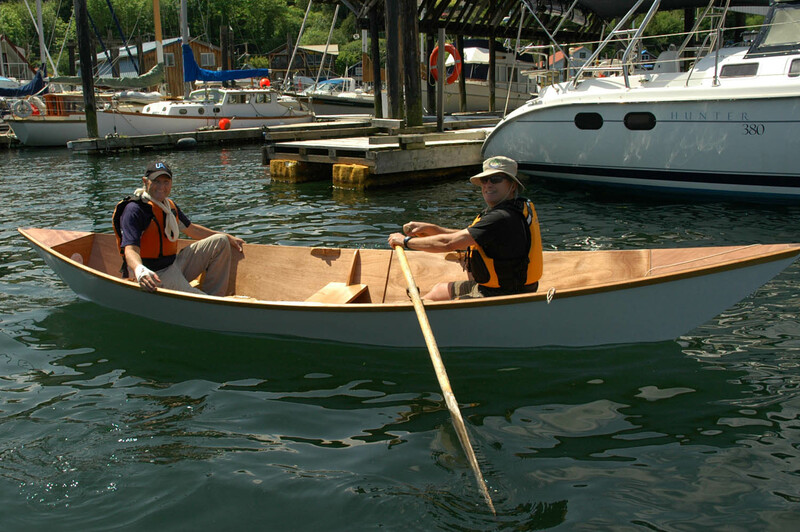 “Josey”, a small Aitkin designed cutter. Jilly and our Portuguese Water Dog, Maio, aboard Rainbird in Montague Harbour, BC. 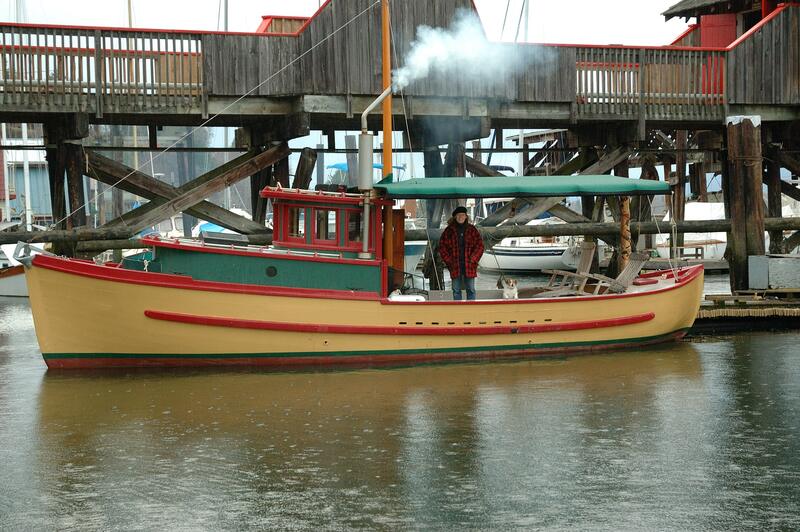 Three years ago, my wife, Jilly, bought a 33′ Bill Garden designed, pilot house sloop Rainbird. 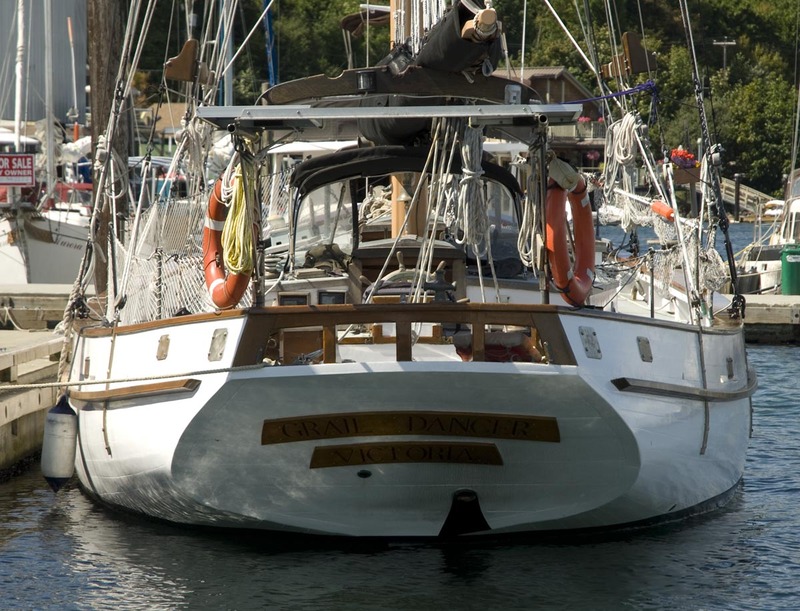 As far as we can determine, she was built in Canoe Cove on Vancouver Island in the late ’70s by Gerry Anderson. She is cold moulded using red cedar, with fir-ply bulkheads, decks and cabin sides. Her interior is highly functional with ample storage – nothing fancy but built with thought and care as a live-aboard vessel. 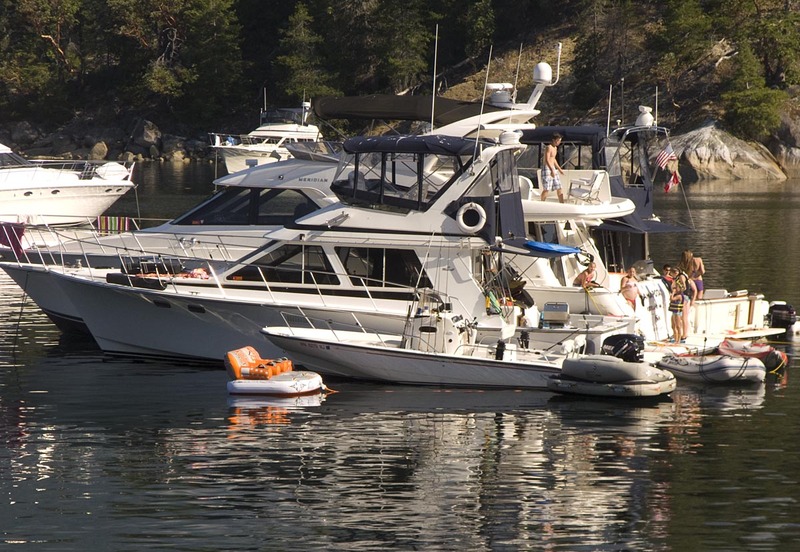 A Dickinson Pacific stove is the cosy centre-piece, making this an ideal boat for the Pacific North West. Gerry Anderson carried out Bill Garden’s vision to perfection. 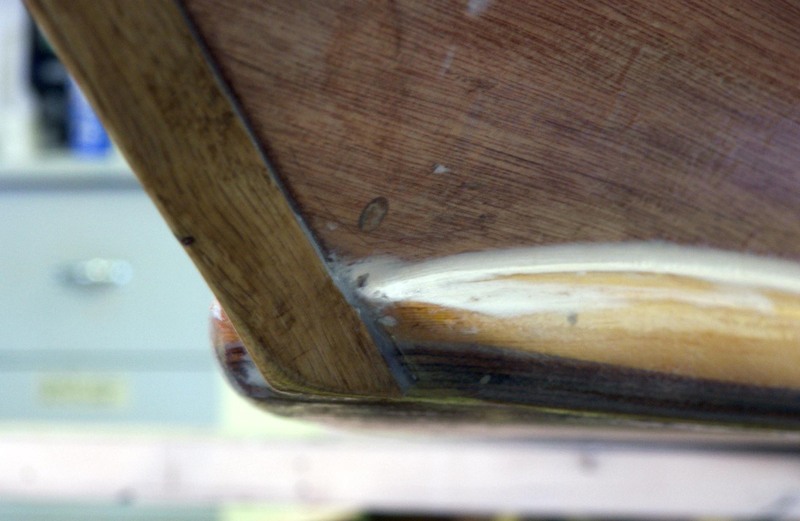 Having built several wooden boats and repaired and refitted many others, I am struck with the care, perseverance and passion that builders lavish on their projects. Many are undoubtedly works of art. 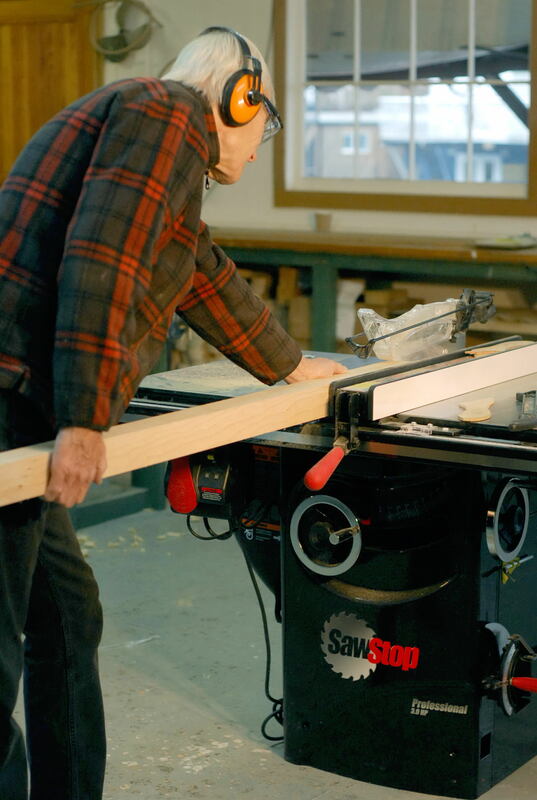 No two will ever be the same – even when from the same stock design – as each will be imbued with the essence of its builder. Flip open the latest edition of Cruising World (July 2012) and you will find an inspiring article written by Thies Matzen, about 30 years of adventure aboard Wanderer III. As any sailor worth their salt will of course know, this traditional wooden boat belonged to that most famous cruising couple, Eric and Susan Hiscock. 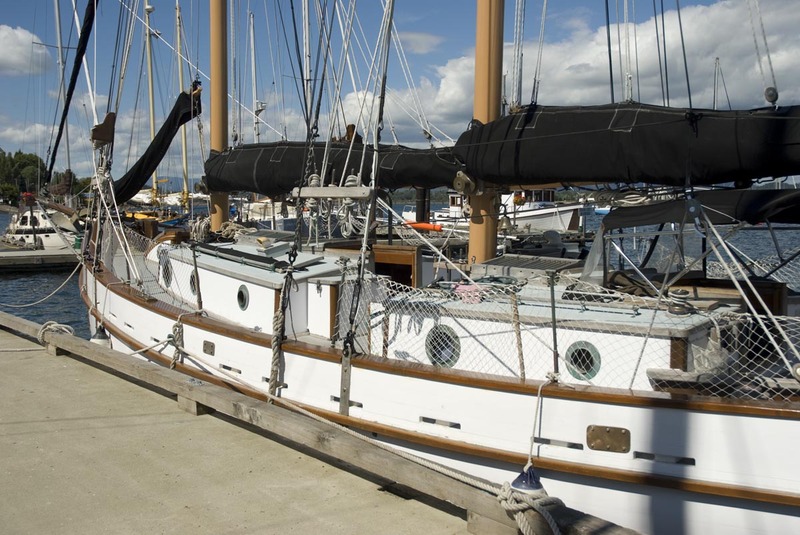 The Hiscocks had this 30′ Laurent Giles design built for them and launched in 1952 and subsequently made two leisurely circumnavigations and wrote the classic sailor’s bible, Cruising Under Sail. 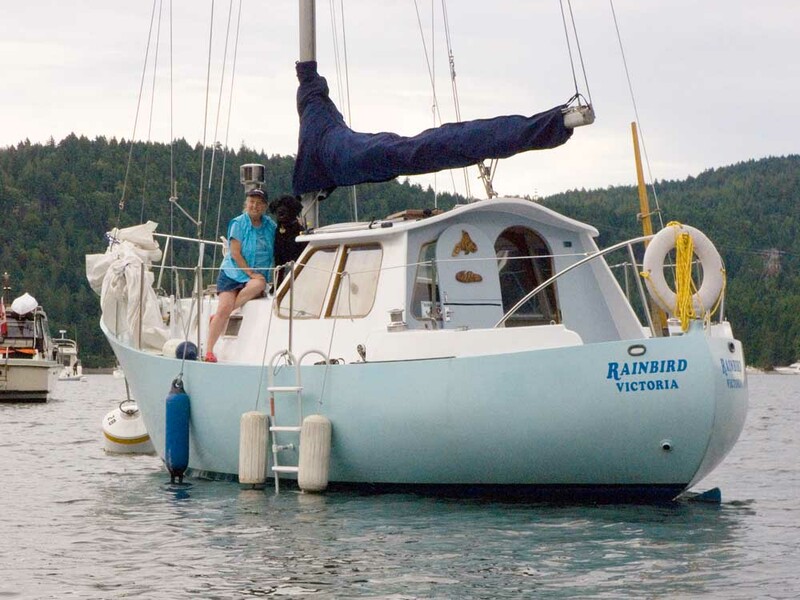 Like Wanderer III, Rainbird is astonishingly functional, having been lived aboard for 30 years and cruised extensively in the Pacific North West. I often wonder about the original builder. 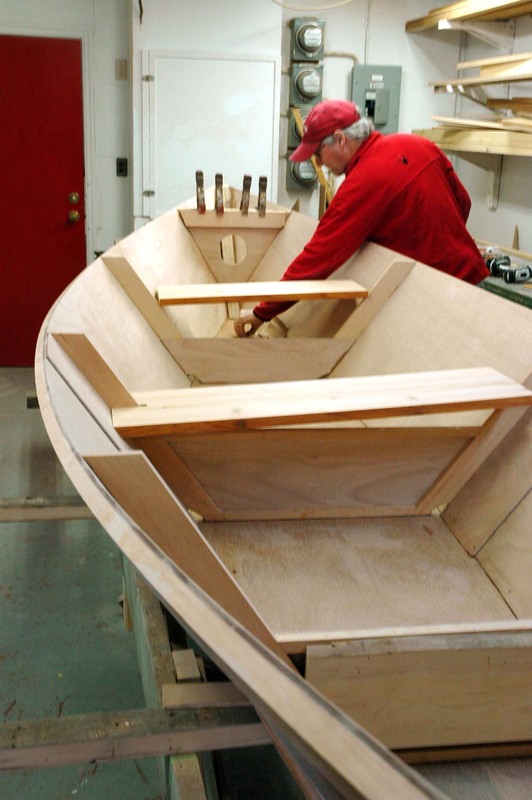 Putting together a boat like this requires extraordinary vision, dedication, skill, perseverance, understanding from loved ones and of course a big chunk of cash. Had he spent years saving and planning? Was he building full time? Was this the first boat he built or indeed the last? Does he ever wonder where she is or how well she is cared for? Taking on Rainbird is like being being handed a torch kindled by the designer and brought fully into flame by the builder. As current custodians we have to nurture the flame to illuminate our future voyages of awe and adventure.